Donovin Lee Darius was born August 12, 1975 in Camden and grew up in nearby Blackwood. A fast and powerful athlete, he was drawn to football and track, specializing in the hurdles. He was a huge Eagles fan as a boy. Donovin transferred from Highland Regional High to Woodrow Wilson in Camden proper after his sophomore year. Donovin became the star of Darrell Wilson’s Mighty Tigers and was recruited as a defensive back by several major football programs. Donovin accepted a scholarship from Syracuse. He set school records for tackles by a defensive back and was named All-Big East as a sophomore and junior. As a senior, he was honored as the Big East Defensive Player of the Year. Syracuse went 34–14 during his four varsity seasons and won the Liberty Bowl in 1996. The 1998 NFL draft was rich with game-changing defensive backs. Donovin went to the Jacksonville Jaguars with the 25th pick. He was a major part of the club’s first division title in his rookie season, and played well in the playoff upset of the Patriots. 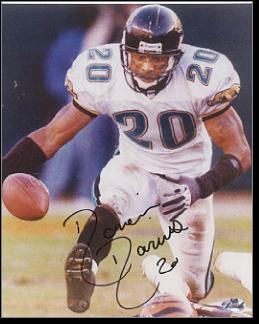 In 1999, the Jags had the NFL’s best record at 14–2. Beginning in his rookie year, he led the team’s DB’s in tackles seven seasons in a row. He had 14 career interceptions as a strong safety, including 4 in 1999 and 5 in 2004. He also recovered 4 fumbles in 2004. In 2005, Donovin tore his ACL. In 2006 he broke his leg. He tried to catch on with the Raiders and Dolphins, but he was not the same player. He retired in 2007 as Jacksonville’s all-time leading tackler. After earning his MBA, he went to work for the NFL Players Association.